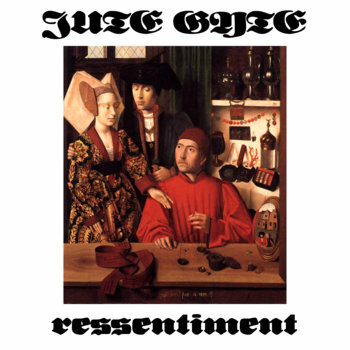 Ressentiment by Jute Gyte Missouri’s marginal quarter-tone experimental black metal one-man-band Jute Gyte returns with a new album that is like the previous ones: worth your time. Black metal can be a tough thing to approach if you’re not into the genre already: the purposefully bad production, the vocal style, the often fast and relentless drumming, and the tremolo picking all support this. On top of that, Adam Kalmbach, the mind behind the music, adds microtonality, in the form of a 24-EDO (24 equal divisions of the octave) musical setting. Compare this to your usual 12 notes per octave guitar, and all this adds is quarter-tones between each semi-tones. Not many bands have used it, and almost all of them are pure crap. It’s not the case of Jute Gyte, however. Since the release of “Discontinuities”, in 2013, I knew that something was going on here, something great. Using long songs, intricate song structures, awesome lyrics, weird and uncommon intervals and rhythms, and even some polyrhythms, Adam has succeeded in selling the idea to my fan ears. He later scored once again with the release of “Vast Chains”, which was reviewed, too, on the blog, but lost when we transferred the website. Now, with Ressentiment, he just made a hat trick! The album is no different from its two predecessors, both musically, and qualitatively. In other words, it’s more of the same good stuff. I won’t review the album at length, because I would be somewhat repeating myself, but I’ll just say that, with the addition of a few new elements, similar to what “Vast Chains” was compared to “Discontinuities”, Ressentiment is a great album. You easily get sucked in the twisted aural realm, and it plays on your mind and guts. You’ll definitely want more! Get the album for free (or pay a little to support) on bandcamp!